My daughter is enjoying her current History Theme – The Kings and Queens of Britain. She is creating a rather LARGE poster showing the lineage / timeline / key facts etc but she has also been going off on tangents learning about different Kings and Queens that interest her. The three above have really intrigued her. The fact that they were all half-siblings from the different wives of Henry the VIII and that even though they had the same father they were raised in different religions and did not seem to like each other. She found the mistrust between the half-siblings fascinating and the plotting – oh this family set-up has really amazed her. 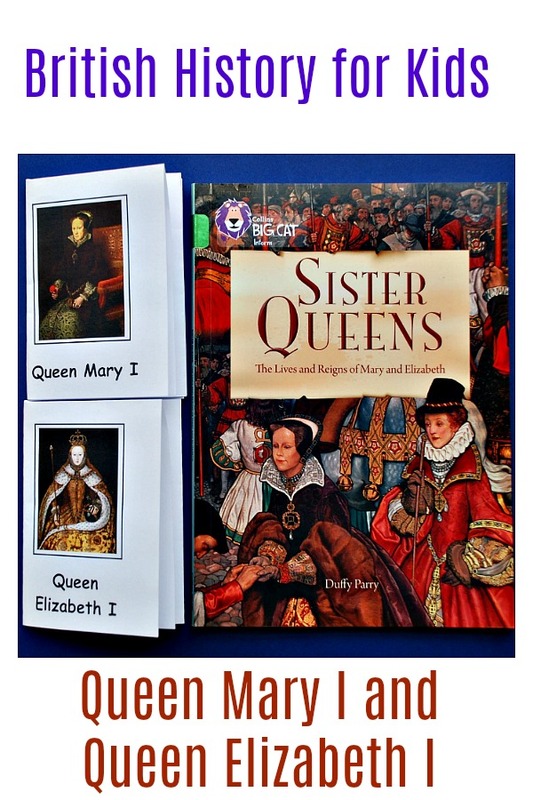 Luckily for us we already owned a very useful book about the siblings – Sister Queens: The Lives and Reigns of Mary and Elizabeth: Band 15/Emerald (Collins Big Cat) . It is a BIG CAT reader and is aimed at primary ages so it does not go into extensive detail but it really does cover a lot of the important facts and key events. Sister Queens starts by explaining Henry VIII descendants and how he married multiple time in order to get the sons that he desired. It talks about Edward’s rule and the nine-day Queen before Mary I came to power. The book talks briefly about how the different children of Henry VIII followed different religions resulting in changes every time a new descendant come to power. It explains why Mary was called Bloody Mary and why Elizabeth was Good Queen Bess (but no gruesome detail). After Mary came Elizabeth and because her reign was for longer and seen as more succesful the book does include more information about Elizabeth than Mary. 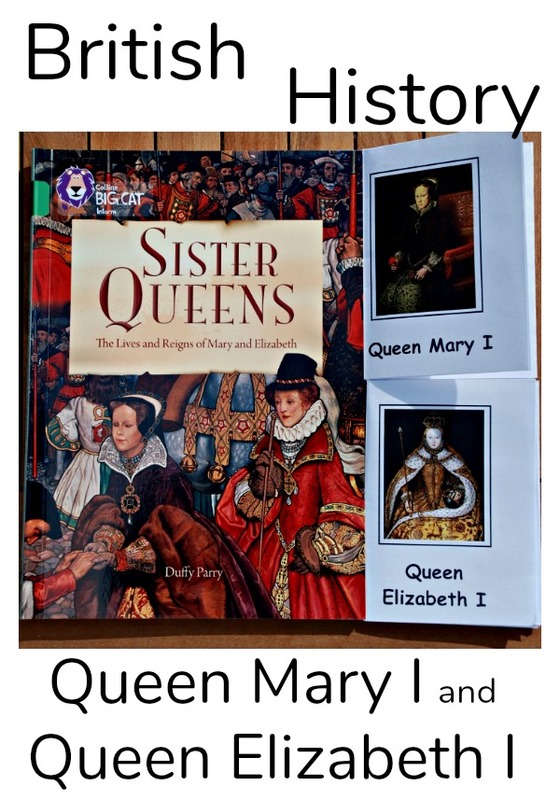 In fact the she used thee Sister Queen reader as her source when she created her summary Booklets of both Mary I and Elizabeth I. With Elizabeth she actually used 2 of the Booklets as even though she was summarizing the facts there really was a lot more that she felt she needed to include. I must admit from my point of view this has been a great exercise in Summarising facts. Something which she has struggled to do successfully in the past as she tends to always want to include detail. But reading the Sister Queen book and then trying to include just key facts in her booklet really made her think about what was a key fact and what was extra detail. And just to mention something that she also found useful and it is in the pictures above was the Six Wives of Henry VIII booklet also from the Activity Village site. It really is helpful when you are looking at Henry VIII’s children. 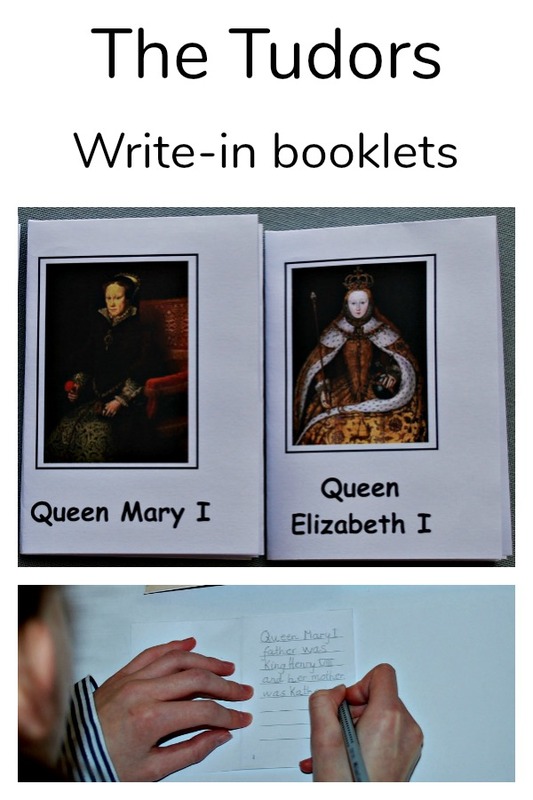 This entry was posted in History and tagged activity village, Big Cat readers, British History, home ed, home education, homeschooling, Sister Queens. Bookmark the permalink.